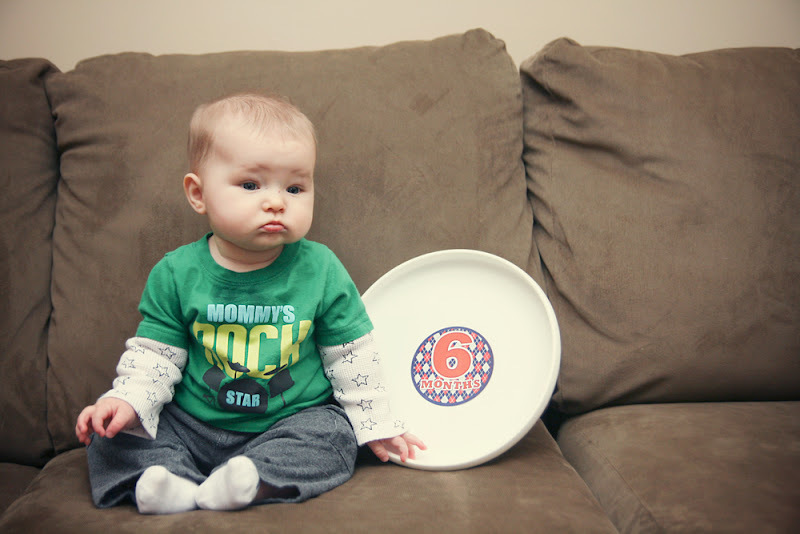 Just 1 Step: Greyden - 6 Month Picture and an Update (Finally)! Greyden - 6 Month Picture and an Update (Finally)! Yes, that's right. 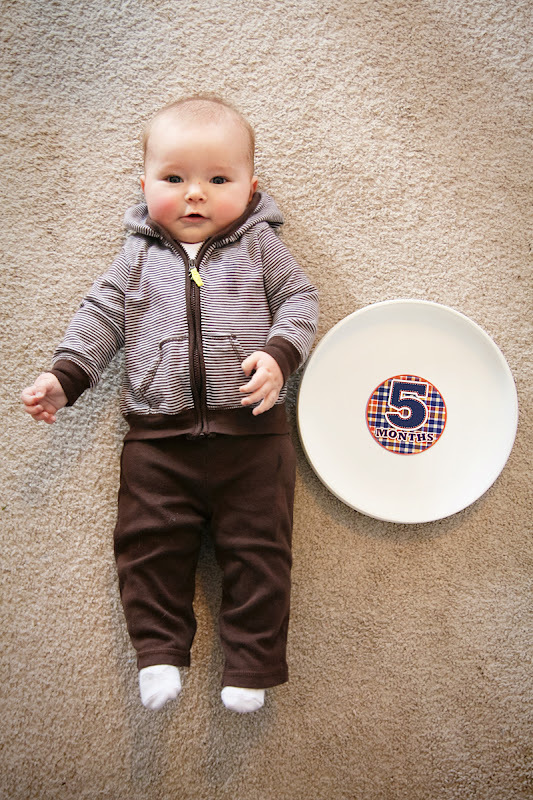 My itty bitty boy is now six months old. Halfway to his first birthday. Craziness!! The last time I wrote a blog update on your life, you were 12 weeks old. 12. You are now...get ready for it...26 weeks. Yes, 26. That means your momma here has done HORRIBLY at documenting your life for the last 3 1/2 months. Downright horrible. Fortunately, I've been keeping little notes typed up on my phone, so I can still remember important dates. Mid November (~3 1/2 months old), you started really gnawing on your hands. On Sunday, November 25th (almost 4 months old), you started pulling toys into your mouth for the first time while laying on your playmat. 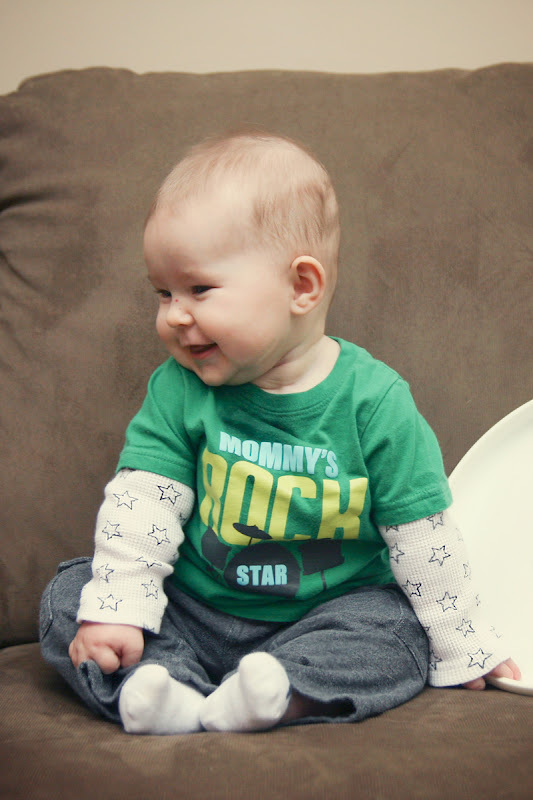 Now, at six months old, anything that touches your fingers lands in your mouth. In fact, you even paused for a moment while nursing today to grab my phone out of my hand and see if it was any tastier than your milk. 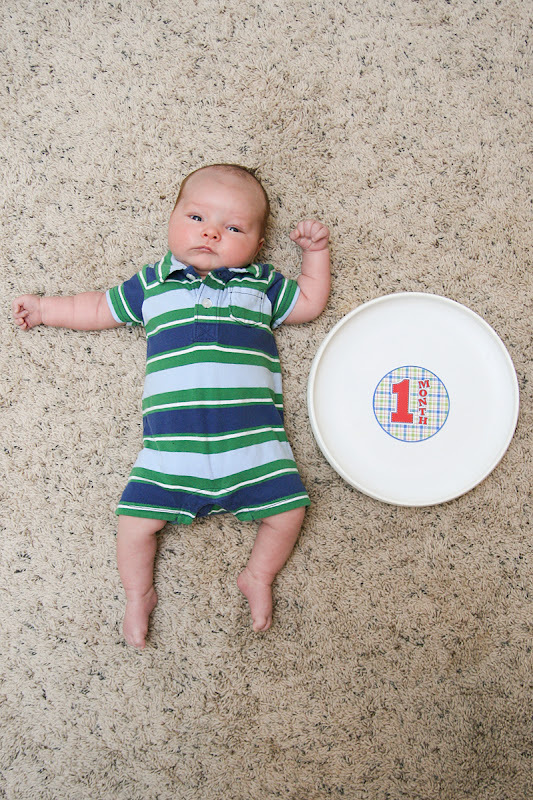 The first week of December (4 months old) you started rolling onto your right side all the time. We also got out the jumperoo that week (Dec 9th) and discovered that you really enjoyed it. However, you still have yet to actually bounce in the jumperoo. You just like looking at the toys. And regarding rolling onto your side...that's still as far as you've gone. That's right, child...you are six months old and you have yet to roll over. I don't know what to do with you. Boy do I try to get you to roll over. I've gotten physical therapy advice through a friend and followed all the suggestions. I've let you cry through many bouts of tummy time. I roll you back and forth, back and forth, trying to teach you the motion. I try to entice you with toys. Nothing works. You are not a smidgen interested. 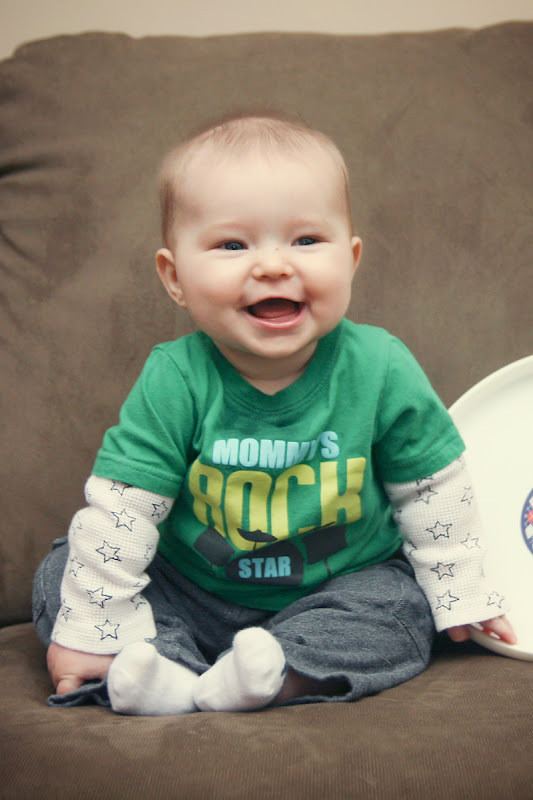 I started feeding you solid foods at 4 1/2 months old, because you started waking up once or twice a night to eat and I really couldn't handle it. Especially not on work nights. 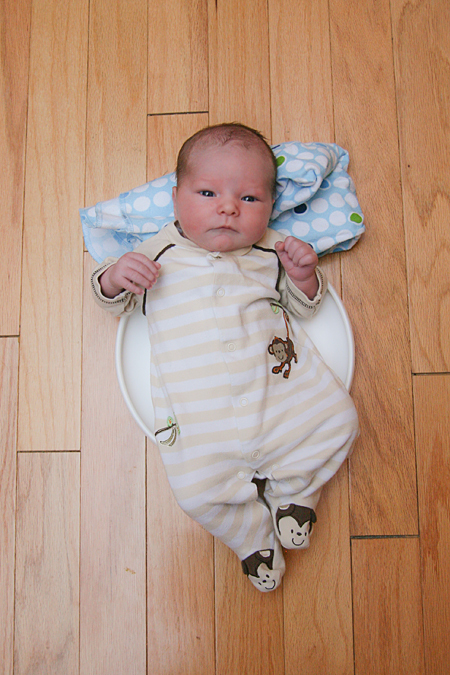 Once I started you on solids, you slept through the night again. Until the last couple of weeks, when you started waking again. I upped your solid intake to three times a day, and then you slept through the night again. Until last night. And now I really don't know what to do. More than three times a day seems a bit extreme. Guess I'll be asking the doc about it at your six-month checkup on Friday. I started you out on baby rice cereal, and since then you've eaten quite the variety of fruits and veggies. You've eaten every one of them, although you were gagging a bit on carrots the other day and I had to cover them up with applesauce. So I may not be buying carrots again for a while. 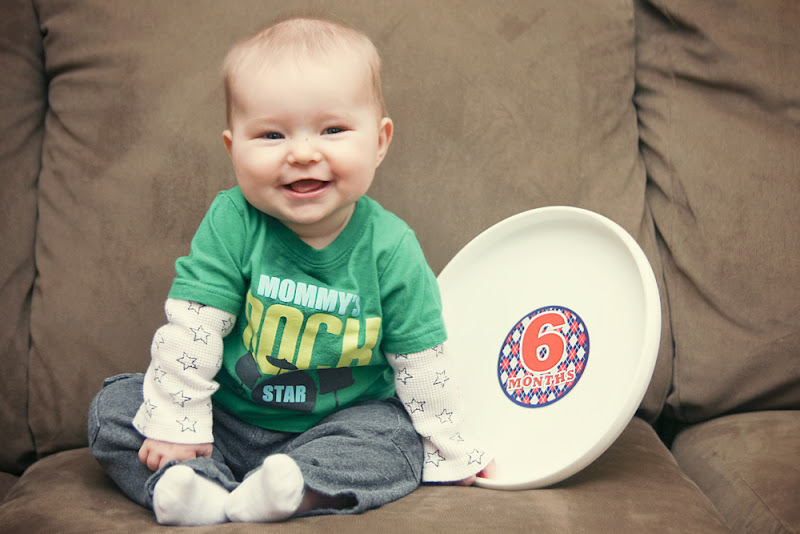 Speaking of your six-month checkup, I'm anxious to see how big you are this Friday. 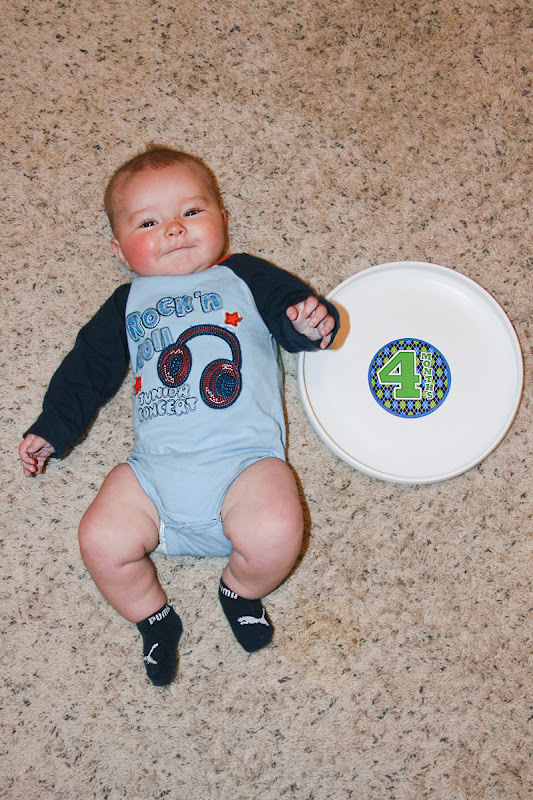 At your four-month checkup, you were 16 lbs 14.5 oz (86th percentile), 26.75 inches long (95th percentile), and your head was 16 3/4 inches around (59th percentile). 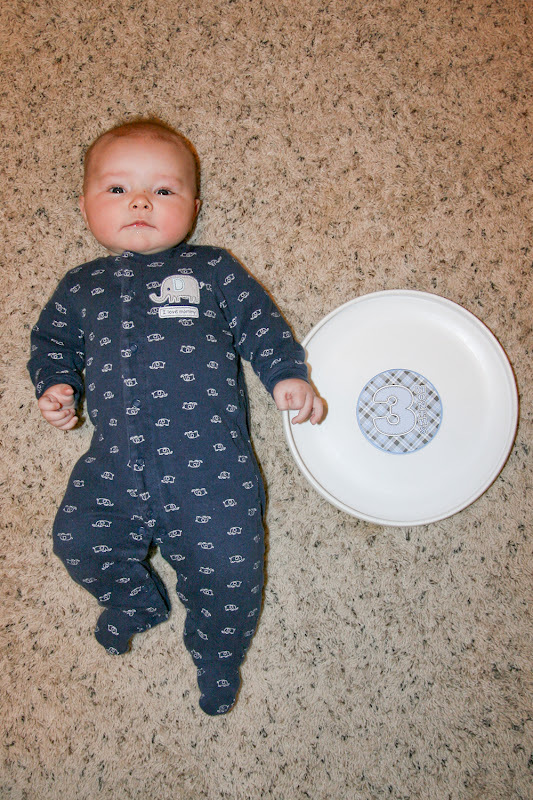 Right now you're wearing size 2 shoes, size 3 diapers (size 4 to sleep), and mostly 9-12 month clothes. 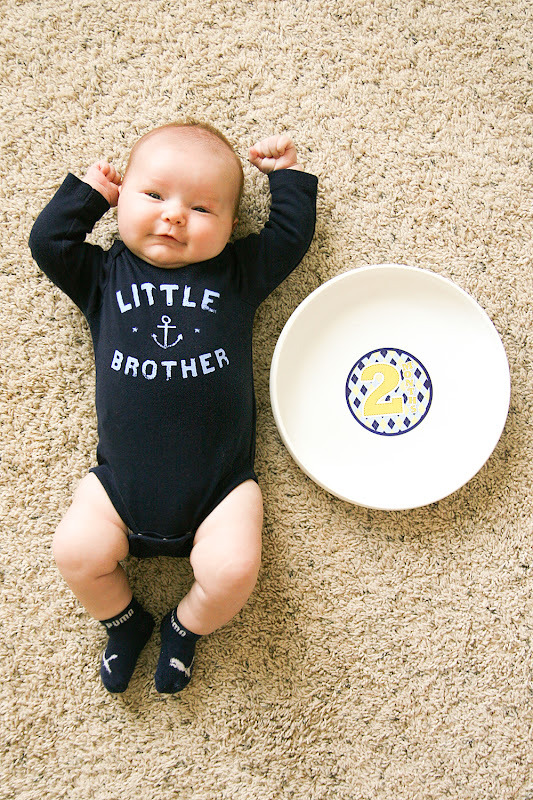 You're bigger than your brother was at this age, and that combined with you two being born in opposite seasons means that I've actually had to buy quite a few pieces of clothing for you. I wasn't expecting this...for some reason I always thought you'd be able to use all of his clothes. But that hasn't really been the case. Can't say I always mind...I've loved having an excuse to buy some cute outfits for you. You are still the opposite body shape of your brother as an infant. All of his chubbiness always went to his belly. Yours all goes to your arms and legs. Child, the chub on your arms and legs is INSANE. When wearing a onesie, your thigh fat bulges out sideways from the leg holes. And the fat on your ankles rolls over on your socks. Meanwhile, you've got barely any fat on your midsection. It cracks me up. And I love it. Your daddy's favorite part of your chubbiness is your knuckles. He thinks it's absolutely adorable how you have deep indents in place of your knuckles. He's right, it is pretty cute. One thing I've discovered about you is that you are not at all a cuddler. You want to be held, but you're not a cuddler. You always want to be up and alert, looking around. The times you do lay your head on my shoulder are few and far between. To get you to fall asleep in my arms, I have to practically pin you to my body, laying on your side, and then you resist quite a bit. This part of your personality is quite different from your brother. From what I remember, he was always happy to lay his head on anyone's shoulder. Sometimes it's a little sad, but mostly it makes me appreciate the few cuddles I do get. Oh, and you are a talker. And a squealer. You jabber, jabber, squeal. Quite a lot. Tonight I had to send you upstairs during my Bible study's prayer request time because you were being so loud that I could barely hear what others were saying. And sometimes you wake up in the middle of the night and squeal and jabber for an hour or so. Those nights are pretty hard on your mommy and daddy. We don't want to turn the monitor off, because then we won't hear you when you cry, but then we have to lay in bed awake because we can't sleep through your squeals and chit chats with yourself. One thing I've really loved watching develop is your relationship with your brother. You think he is the coolest thing since sliced cheese. Seriously, you could watch him all day. Oftentimes, if you're in a crabby mood, I'll just sit you somewhere where you can see him. And then the crabbiness will disappear because you love watching him so much. He's actually starting to warm up to you, too, and show you some love. I hope and pray that one day you two can be close as two peas in a pod and have all kinds of fun together.